Solon City Council Nov. 1, 2017 left to right Lauren Whitehead, Mark Prentice, Mayor Steve Stange, Lynn Morris and Steve Duncan. Councilor Shawn Mercer participated via video conference. My reaction to the Nov. 1 Solon City Council meeting was amazement. 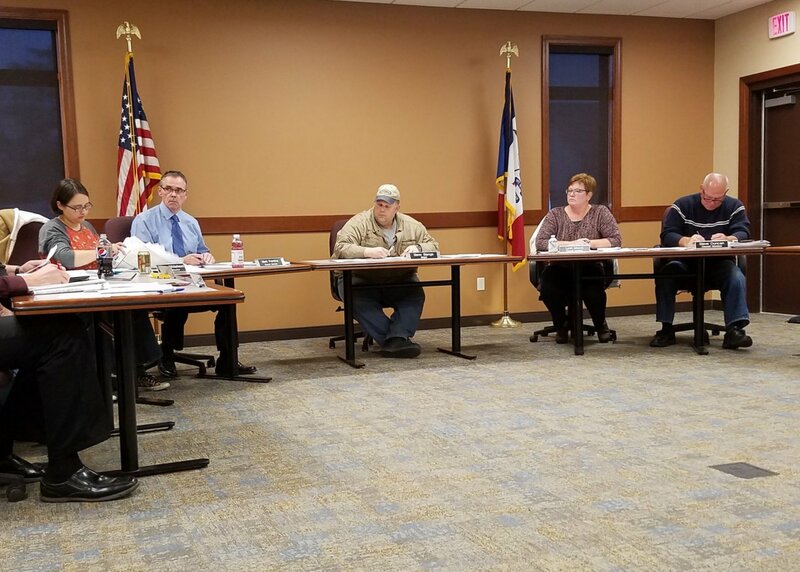 I was amazed at how helpful council was being — a living demonstration of being good neighbors and Iowa nice. Gallery Acres West requested a hook up to the city water supply. The City of Solon has no obligation to provide the service. Despite the fact Gallery Acres West has been delinquent in complying with the 2001 arsenic standards for public water systems, council politely and professionally is hearing them out. Councilors want additional information before making a decision. Mayor Stange said he would like a decision by the end of the year. Whether council votes for the final proposal is an open question. Information of varying quality has come out over the subdivision’s proposal and related issues. Council is smart to sort through what’s been presented before deciding. However, the bottom line is leadership of Gallery Acres West decided homes could use high arsenic drinking water since 2001. It’s not the city’s problem. Why didn’t the subdivision comply? During an Oct. 30 phone call with the president of their home owners association, who recently moved to the subdivision, I asked him that question. He told me it was the cost of compliance. With only 14 homes in their association compliance would run thousands of dollars per household. Who wants an unexpected expense like that? At the same time, who wants to risk public health because a community believes they can’t afford it? In 2015, the Iowa Department of Natural Resources threatened legal action if Gallery Acres West did not comply with arsenic standards for their public water system. By then it had been 13 years since their first violation. Push has come to shove and Iowa DNR shouldn’t back down. If Solon decides to help Gallery Acres West I hope council gets all the information they need. Based on Wednesday’s meeting it appears they will. In the meanwhile, 14 homes continue to use high arsenic drinking water.